The former Chairman, Board of Trustees of the Peoples Democratic Party (PDP), Chief Tony Anenihn has declared that he has forgiven his foremost political foe and governor of Edo State, Adams Oshiomhole. He made the declaration on Sunday, at the 10th Anniversary of St Anthony’s Catholic Church, Urhomi, where the Governor was given an award for his services to the Church. 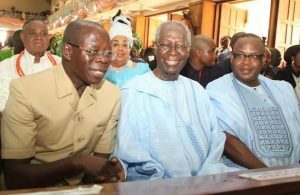 Anenih who referred to the Governor as his son, said a recent health challenge he suffered made him realize the need to rise above politics and embrace peace with all men. “I was in St. Paul’s Church in Benin, and as my son, Comrade Adams said, we were all there appreciating the efforts of the Archbishop. “I want to say this, it is not because Adams is here. Last night, I was telling my wife that I met Adams in the church, and with my immediate medical experience, I have decided to forgive all those who offended me. And I specifically mentioned Adams. “Adams, without you saying it, I have forgiven you. As you said when you were in labour, as president, you were my son and you know it. You came into politics and you remain my son. So, the common cook that used to cook ogbono soup for us is still there,” he said. He thanked the church for reuniting him with top members of the opposition party, just as he lauded their efforts in nation building. “I believe the fact that Nigerians live in relative peace and harmony in spite of the failings and weaknesses of political leadership at all levels, is due to the power of your intercession, the power of your prayers. “We cannot thank you enough for your prayers and your support in spite of our weaknesses,” he said. The Governor praised the Catholic Church for bringing people of different political persuasions together under one roof for the Church programme. “Yesterday, I found myself sitting in the front row, and then I realized that most of those drivers and shakers of politics and ‘politricking’ in Edo State, are all Catholics. That, for me, is revealing. “For me, the church has caused all of us to reunite in the State. So, I reunite with my daddy Chief Tony Anenih and several other PDP leaders and APC leaders. And the Catholic Church brought together the national Chairman of APC sitting side-by-side with the national leader of PDP. The Church anniversary was attended by Mr Anselm Ojezua, APC Chairman, Edo State, Mr Dan Orbih, PDP Chairman, Edo State, former Governor of the State, Prof Oserheimen Osunbor as well as former Governor of Delta State, Dr Emmanuel Uduaghan, among others. Elections: 15 Political parties threatens boycott over card reader use.